LulzSec, the computer hacking collective thought to have disbanded after hitting a string of high profile targets including Sony, have returned to strike at News International in protest at the recent phone hacking scandal. Targetting The Sun newspaper’s website, the group redirected the tabloid’s homepage to a fake story reporting the death of News International owner Rupert Murdoch complete with typo in the headline (Media moguls body discovered). 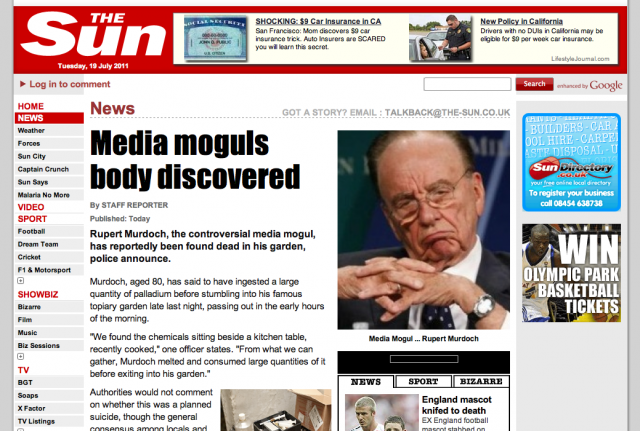 It claimed the media mogul had died from a drug overdose. The Sun website is now back up and running with official content! Lulzsec also redirected the paper’s official Twitter feed to the groups @LulzSec account. It’s not merely faked news stories that LulzSec are touting however. They claim to have nabbed plenty of personal information on News International employees, with the group posting The Sun journalists phone numbers online, as well as email details of former News International chief Rebekah Brooks. LulzSec claim to have plenty more sensitive information to share too, so expect to see more headaches for News International head online in the coming hours and days. YouTube hit Rebecca Black is back with My Moment, but can she ever produce another Friday?